Yarn and Fiber Happenings: Ivy Brambles brings us Spring Showers of Pave Diamonds and Beads with Cashmere! Ivy Brambles brings us Spring Showers of Pave Diamonds and Beads with Cashmere! Hi Everyone and Happy April! Spring is upon us and we are happy to announce the new Ivy Brambles Halo Pave Shawl pattern which has arrived with the gentler Spring temperatures! The Halo Pave Shawl is another gorgeous shawl designed by Jocre Arts and is made up of leafy diamonds surrounded with a halo of smaller diamonds and finished in a wispy lace edge. This triangular lace shawl adds glamour to any outfit and is easily worn for everyday or evening wear. The Halo Pave Shawl uses only one skein of the Ivy Brambles Romantica Lace and is shown in the colorway Autumn Flame. 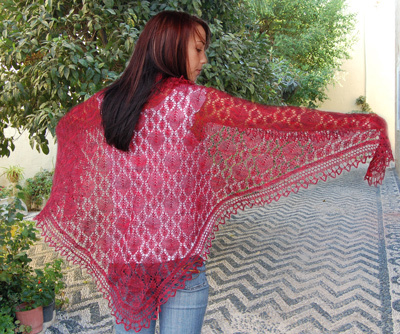 Another beautiful shawl from Ivy Brambles to add to your collection of must have lace shawls! Looking for a fun and easy project that can be very addicting? 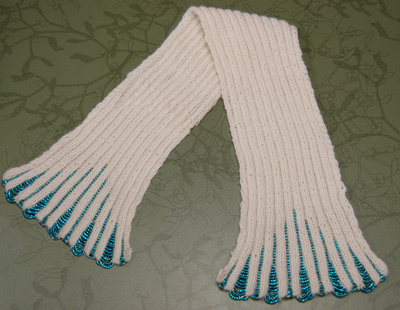 Try the luxurious Beaded Cashmere Scarf which is easy to knit, and fabulous to wear. A classic design using Ivy Brambles 4-ply Cashmere. Scarf is knit in two identical sections which are then grafted together. But be warned, because these knit up so nice and easy, no one can make just one! The color combos are endless for the beads with the yarn and because the cashmere is so soft and light, it makes a great scarf for all climates! Enjoy your week and Happy Fibering!